Welcome to Day 2 of my giveaway! Today, I am going to share with you about one of my favorite bloggers! Also, check the bottom of this post for a FREEBIE! Today, I want to talk about one of my favorite bloggers, Babbling Abby. I have been reading her blog for a while now, and I am always inspired. This girl is FULL of great ideas! I always loved reading all the fun ideas she had when she was a classroom teacher. Now that she is out of the classroom, I love all the RTI and other assessment activities she has come up with to assist other teachers in their classrooms. I don't know about you, but I find this whole process overwhelming at times. Then I read Abby's posts and I think "Why didn't I think of that?!" She makes it seem so easy! The very first item I purchased on Teachers Pay Teachers was Abby's "ar" unit when I was teaching first grade for the first time. 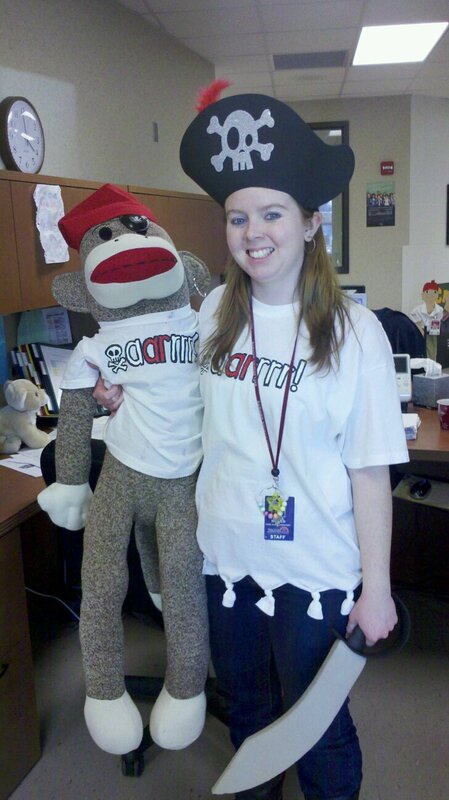 My students loved that I dressed up as a pirate (thanks to her tutorial on making the t-shirt even though I had to hand paint mine because my printer is broken!) and they loved searching the school for "ar" words! (I just loved having an excuse to wear my new boots to work!) I purchased a cardboard treasure box and stuffed it with chocolate bars and pirate eye patches for each student. We also read the story she included with the unit, which is so super cute. She has other fun units in her store like the "Sweetheart Snatcher" or the "Candy Corn Bandit". Too cute! I purchased this unit to use last year, but life (ok, grad school!) got in the way and I didn't get to use it. I can't wait to use it next year. I already have my pink envelopes and heart shaped stickers ready to decorate my hints! I know my students will be so excited to hunt around the school again! I love those kinds of activities, so I love that Abby has several of them in her TPT store! Her stuff isn't all fun and games, though! She also has some really awesome assessments in her store, such as the 20 and 25 day check-ups, and some RTI packs. Plus, there are some freebies in her store to use with the RTI activities. 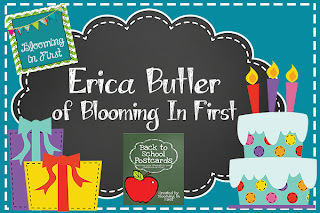 I don't just like her blog because of her TPT units. She is hilarious as well! Her posts are always so real. Like the time she admitted that she goes to Walmart multiple times per week before school, or the post where she wrote about wanting a bodysuit. :-) Not only does she have great ideas, it's just fun to read her blog! 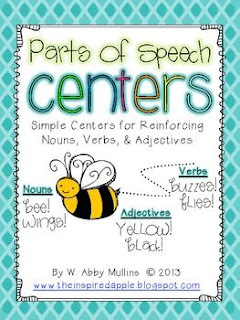 Abby has so generously offered to give away her "Parts of Speech Centers!" One lucky winner can win this, along with 4 other activities from some of my favorite bloggers, and 2 items from my store! In case you missed my post yesterday, here's what you can win! From my store, I am offering 2 things. You can choose 1 postcard set from my store, which I will customize for you if you like, and any one item from my store that you can choose. 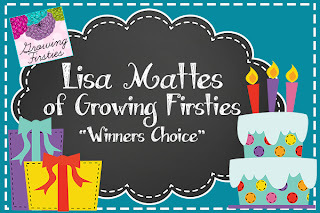 Lisa Mattes of Growing Firsties has agreed to let the winner choose one item from her store. She's got some really great stuff in her store! I have a few of her "Common Core Crunch" packs, which are full of activities for language arts standards. I have used some of these activities for homework, and some of them for activities in the classroom. They are easy and quick! I also have her Personal Narrative Unit, which has some wonderful ideas for teaching Personal Narratives. I will be using it again this year! 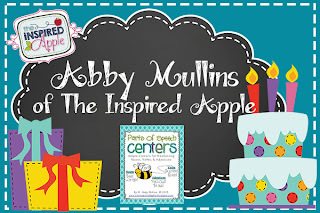 Abby Mullins of The Inspired Apple is donating her "Parts of Speech" centers. These centers are awesome! I know my students always need some extra help with nouns, verbs, and adjectives. There are sorts, charades, sentence making activities, and more in this pack. 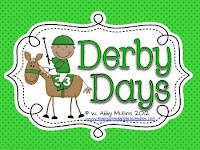 I know my students will love practicing nouns, verbs, and adjectives with these activities! 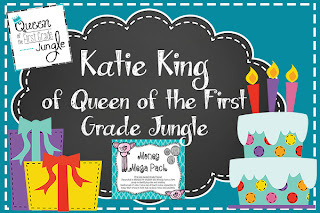 Katie King from Queen of the First Grade Jungle agreed to donate her "Money Mega Pack". I know that money isn't in the first grade math standards, but I believe it is so important that we work with students on these skills! This is a great way to get some extra practice! These centers are great for students who have a good grasp on coin values, and I definitely will use them with my advanced firsties! 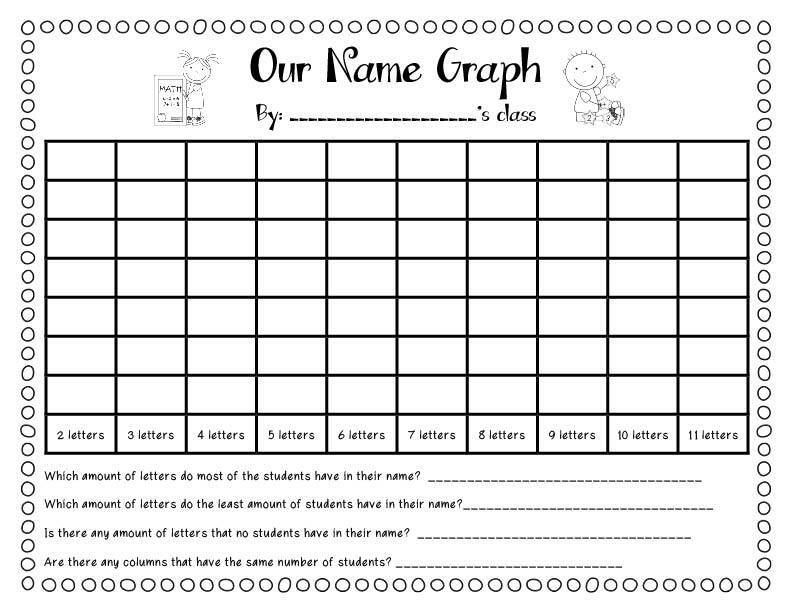 Plus, they will work great for differentiating math centers! Since I started teaching, Math centers/workshops/activities have always been a struggle for me to set up and maintain. 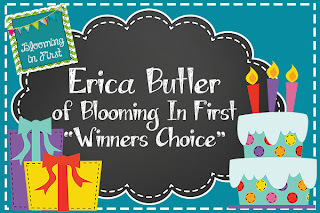 There are some things I struggle with, and one of those is student choice! 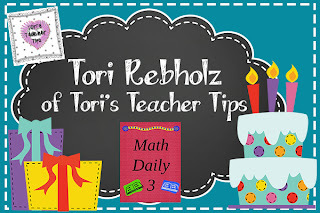 I love Tori Rebholz of Tori's Teacher Tips' Daily 3 pack. 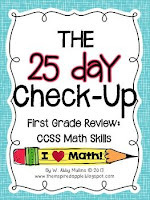 It helps you set up Math Daily 3 in your own classroom. If you love Daily 5, you will love this! And I know I will take all the help I can get!!! Also, this is an EXCLUSIVE giveaway! Tori has never used this item in a giveaway before! :-) So the winner will be extra lucky to get this pack! 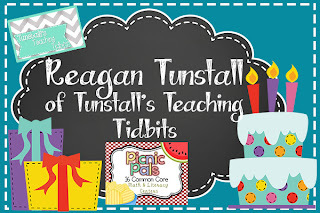 Reagan Tunstall has agreed to donate her "Picnic Pals" Common Core Math and Literacy centers. Just like all of her other ideas, these are fantastic! They are super cute, and yet still rigorous, centers with a fun picnic theme that can be used any time of the year! These centers made me want to run out and buy a picnic basket and picnic blanket and have a picnic right there in my classroom! I don't know where she gets her amazing ideas, but she is awesome. This giveaway will end on August 4, and I will choose a winner sometime on August 4th or 5th! Please make sure you check back this week- you can enter each day by leaving a blog comment on that day's post, and there is a pretty good chance there will be some other items I will be giving away throughout the week or freebies I will be posting! I will be back later with my first blogger post! So now that you have read about one of my favorite bloggers, I have a freebie for you! One of my favorite books to read at the beginning of the year with my first graders is Chrysanthemum. There are so many things you can teach with this book. I really love Kevin Henkes. I have been doing a name graph for several years now at the beginning of the year. 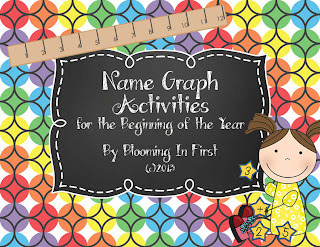 Today's freebie is a Name Graph pack. It has 3 different graphs (where the number of columns vary) and the option to do the graph as a class or for each individual student. If I were doing this with second graders, I would most likely use it as a student recording sheet. With my first graders, I will be using it as a whole class activity. If you download, please remember to leave feedback! Thanks for following! Remember to check back tomorrow for more blogiversary fun! I really like all of Abby's vowel activities. In first grade especially at the beginning of the year we are always reviewing vowel sounds and these are perfect for them. THis is a great giveaway! Keeping fingers crossed. Abby has the cutest products. I didn't have to go far to find what I'd really like to have for this year's progress. 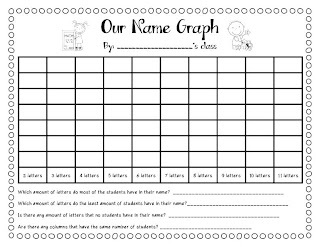 I would love to have Kindergarten RTI: Letter Recognition & Identification. This would be a great resource to use with my strugglers so they have something different to help them over the hurdles. Thank you! I love the Queen's Busy Teacher's packs!!! I like the Parts of Speech resource. I love Abby's money packet! 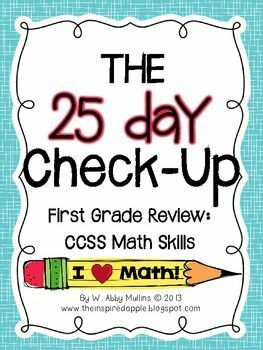 I will be teaching a 1st/2nd combined class and I think my kiddos would love this! These are all great giveaways from bloggers I already follow! I love Abby's wizard of oz unit! I love the Candy COrn Bandit! I like her Fun with Firsties (Back to School) which I own. One Whole Year Blogging Blogiversary Celebration!